Managed print services (MPS) continue to evolve as more businesses request solutions that offer data protection, maintenance, and cost management. This transition leads to a new sales model that streamlines various document paths, allowing for the creation of managed document services (MDS). MPS/MDS enable enterprises to rethink how they handle document output and management strategies—with most solutions now designed for specific sectors. The primary goal of MPS is to increase business efficiency. Traditional methods were primarily accomplished through hardware and cost cutting. The most prominent MPS/MDS focus areas today include security, mobility, and productivity. According to DeSanti, security involves ensuring company information, access points, and output devices are secure from cyberattacks while mobility enables the workforce anywhere, anytime—from home, on the go, and in the office. Additionally, productivity leverages software and process adjustments to improve operational efficiencies and enhance business workflows. Instead of paper-centric organizations, business now have scans, data protection, maintenance, and cost management. “These are not just consultant buzzwords, they are the everyday experience our customers face,” offers Purdue. The Internet of Things accelerated the creation of large amounts of data that businesses now must collect and manage in the digital age. 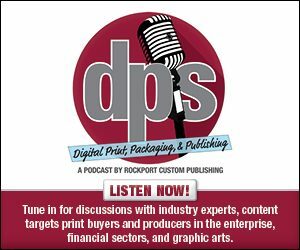 As this proliferation continues, organizations look for actionable insights on how to streamline business operations, increase security, improve employee workflows, and save money, says Matthew Schmitz, MPS/global business development VP, Xerox Corporation. “At Xerox, this means delivering insights above and beyond the common standards of MPS in order to help customers simplify complex processes, enhance workflows, and move the needle towards digital transformation,” he comments. In the last few years, MPS shifted away from storing documents and data in on-premise data centers and toward cloud-based repositories that have the flexibility to ease IT burden and enable mobile work, collaboration, and streamlined workflows, shares Schmitz. MPS/MDS’ evolution into an all-encompassing communication solution helps enterprises rethink how they handle document output and management strategies. Today’s MPS solutions are increasingly sector specific, which also affects document output and management strategies. For example, in health and government, Purdue sees a large emphasis on privacy and cutting costs. In other industries, customers are more aware that their return on investment is received in different ways, including improving project delivery times, downtime elimination, and contributing to the team’s digital dexterity. “Organizations are realizing that their MPS can be an effective tool for enabling strategic business aims, in addition to simply saving time and paper at the printer,” he shares. In addition to document output and management strategies, there is a major emphasis on business intelligence—leveraging data for scientific analysis that drives more deliberate outcomes. As a result, DeSanti believes customers now have a trusted resource to help them visualize, define, implement, and deliver quantifiable business improvements, continually refining their strategies to meet changing business dynamics. The newest and most popular MPS/MDS solutions enable businesses to reduce costs, improve productivity, and reduce environmental impact. Here, we provide a selection of available MPS/MDS solutions. Konica Minolta’s Optimized Print Services reduces printing costs, frees up capital, and eliminates the burden associated with supporting and maintaining printing infrastructure. Its solutions include print consulting, change management, fleet management, print governance, and bizhub Secure. Konica Minolta’s fleet management monitors businesses’ printing fleets to ensure it works to the maximum potential. Konica Minolta’s OPS Monitoring Service is a completely integrated monitoring system connected to Konica Minolta devices—adding a new level of service and support. Working silently in the background, OPS Monitoring Service collects meter readings for accurate billing, automatically requests toner or consumables, alerts Konica Minolta if devices require support, and notifies Konica Minolta of scheduled maintenance activities. The MyQ Solution 7.2 was released in September 2018 for corporate, education, government, and small- to mid-sized businesses. It is designed to be a universal solution by unifying diverse print networks across different brands and models. “Partners SIs and VARs herald MyQ for its ease of deployment, integration, daily operation, and universal look and feel across device brands and models,” says Purdue. With the MPS solution, print jobs don’t go to a single device but instead to the MyQ Server where documents are printed from any device on the network. This reduces print queues and increases overall document security as the document does not print until the sender logs in at the most convenient machine. It also allows users to track and itemize printing per account and see where paper and ink waste occurs to reduce printing costs and help the environment. According to Purdue, pull-printing technology is known to reduce environmental impact across every business department by a minimum of around 30 percent. Additional features include easy scan actions, personalized user interface, integration with DMS, customizable report engine, and cloud scanning integration. MyQ licenses by device regardless of employee number. “We’re moving towards a simpler licensing system with modular pricing to provide customers with the easiest experience with regards to choosing the features that they find most beneficial to their needs,” says Purdue. Toshiba Encompass Managed Print Services provides the solutions, services, and support needed to optimize resources for maximum productivity. From initial assessment to sustainable long-term improvements, it’s designed to help businesses print smarter, work more securely, and improve workflow while saving up to 40 percent. Toshiba offers over 20 integrated software solutions to help with document workflow and capture solutions, enterprise management, cost accounting, and a range of business applications. Overall benefits include improved workflow, increased productivity, reduced costs, maximized control, improved flexibility, and reduced waste. Its MPS offering also includes the Encompass Green Report—a custom analysis that provides accurate measurements of an office’s environmental footprint. The report offers solutions to assist in reducing electrical consumption, CO2 emissions, wasted water, paper waste, and cartridges consumed. Toshiba also offers consumables recycling programs, reforestation, and equipment disposal services. Released in September 2018, Managed Print Services for U.S. Federal Government—Xerox’s Federal Risk and Authorization Management Program (FedRAMP) authorized cloud-based MPS—is designed for federal agencies. Its security features include a partnership with McAfee and Cisco, which Schmitz says offers the highest levels of encryption when communicating with Xerox multifunction printers in addition to automatic security policy management and secure print solutions. The solution offers Xerox MPS applications in a government-only cloud that meets National Institute of Systems and Technology standards. It also includes professional services for consulting, development, installation, configuration, training, and support services for software, additional consulting, and workflow development. “Xerox is the only cloud-based MPS provider that is FedRAMP authorized. Its key features all play a key part in setting Xerox apart from its competition in this space,” comments Schmitz. FedRAMP provides standardized security assessment, authorization, and monitoring for cloud products and services. In 2018 it provided an Authority to Operate to Xerox for MPS services. In achieving this designation, Schmitz says Xerox sets the standard for secure cloud MPS services and can help U.S. federal agencies eliminate the time-consuming, research-intensive process of vetting products for purchase. “With the right MPS solution in place agencies can be assured of world class security standards and achieve a boost of up to 20 percent in both productivity and cost saving,” he adds. MPS/MDS surpass basic hardware management and offers comprehensive solutions that streamline business document paths. A variety of strategies and tools—sometimes sector-specific—ensure each MPS/MDS customer’s solution is customized for cost savings and efficiency. Click here to read part two of this exclusive online series, Efficient Management.